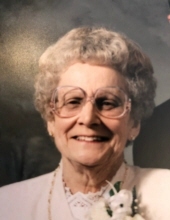 Eleanora Laird, 97, of Varysburg passed away on April 3, 2019 in Warsaw. She was born in Weathersfield, NY on March 29, 1922 to the late George and the late Hazel (Bauer) Parmerter. Eleanora was preceded in death by her first husband; Hurlburt Laird in 1993 and her second husband; Wesley Laird in 1998. Eleanora was the former owner of Laird Brothers Dry Cleaners in Varysburg. She was a member of Johnsonburg United Methodist Church and the Varysburg Fire Department Ladies’ Auxiliary. Eleanora is survived by her two sons; George (Mary) Laird and Terry (Candy) Laird; step sons John Laird, Randall Laird, and Timothy Laird; grandchildren, Peter (Summer) Laird, Christopher (Heather) Laird, Tara (Brennan) Blowers, Niki (Noah) Seward, Zach Laird, and Tyler Laird; 9 great grandchildren; many nieces and nephews. Visitation will be held on Saturday April 6, 2019 from 12:00- 1:00PM. A Funeral Service will immediately follow at 1:00PM at the Marley Funeral Home, LLC. 135 Main Street Attica, New York 14011. In lieu of flowers please make a donation to the Varysburg Fire Department Ladies Auxiliary, 2446 US-20A, Varysburg, NY 14167 or the Johnsonburg United Methodist Church, 3025 NY-98, Varysburg, NY 14167 in memory of Eleanora. For more information please call (585) 591-1212 or to leave a message of condolence visit www.marleyfuneralhome.com. Arrangements completed by Marley Funeral Home, LLC. 135 Main Street, Attica, New York 14011. To send flowers or a remembrance gift to the family of Eleanora Laird, please visit our Tribute Store. "Email Address" would like to share the life celebration of Eleanora Laird. Click on the "link" to go to share a favorite memory or leave a condolence message for the family.